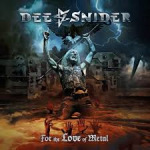 Share the post "Album review: DEE SNIDER – For The Love Of Metal"
Former Twisted Sister frontman Dee Snider’s forthcoming fourth solo album “For The Love of Metal” is his heaviest yet, obviously, he is well known as a great hard rock singer but this shift to metal actually works well with his voice. The album is produced by Hatebreed vocalist Jamey Jasta and features appearances from the likes of Mark Morton (Lamb of God), Howard Jones (Killswitch Engage) and Arch Enemy’s Alissa White-Gluz who duets with Snider on “Dead Hearts (Love Thy Enemy)”. With a modern metallic sound, the twelve tracks on “For The Love of Metal” open with the speed and dual guitars of “Lies Are A Business” and end with the albums bruising title track. Between the two there are such gems as “Mask”, “Become The Storm”, “American Made” and “Roll Over You”, however, the album doesn’t really let up in intensity from beginning to end, in that Jasta has done a great job in pushing Snider to a different place stylistically. This entry was posted in ALBUM REVIEWS, ALBUM REVIEWS (Mobile), All Posts and tagged album, Arch Enemy, Dee Snider, For The Love Of Metal, Hatebreed, Jamey Jasta, Killswitch Engage, Lamb Of God, metal, Napalm Records, review, Twisted Sister. Bookmark the permalink.